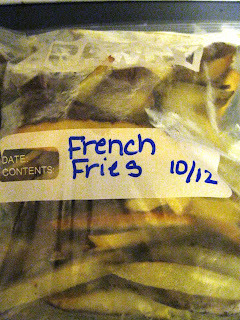 Absolutely NEVER buy another bag of frozen french fries again! 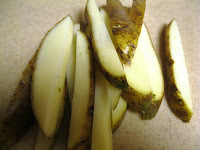 It is super easy to make your own bags of french fries, you can control the amount of fat and oil that the fries are prepared in, and you know where and how the potatoes were grown. You can make regular french fries or sweet potato fries! Jan's tip: You may find it easier to buy a french fry cutter. They run about 15 dollars and are a good investment if you plan on making these on a regular basis. I just used a knife and cut down about 15 potatoes in less than 10 minutes. 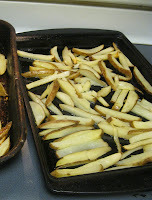 Drain potatoes and lay on single layer on baking pans. 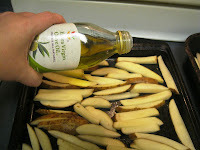 Drizzle fries with olive oil, season with any desired seasonings. Gently toss fries to coat. (You can throw them all in a bowl or bag and shake them if you'd prefer). 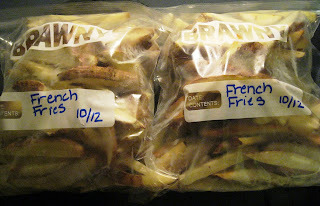 Place pans of fries directly in the freezer so that the fries flash freeze individually in a single layer. Jan's Tip: Don't try to move or jostle them too much, they will break apart. 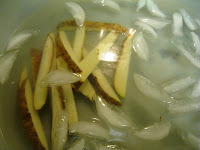 Pull out desired amount of frozen fries and place them onto lightly greased cookie sheet, and bake till desired crispiness. Approx. 15 min. (Or you can deep fry them if you prefer). DO NOT THAW FRIES FIRST. These 2 gallon bags of fries came from 15 average sized potatoes.